I’m an orthopaedic surgeon and sports medicine specialist providing leading commentary and education on sports and exercise injuries, injury treatment and prevention to help you stay healthy and perform your best! This is my personal website. I started writing articles on this site in August 2010 as a hobby. My goal at the time was simple. I wanted to share sports medicine and wellness information in easy-to-understand language for athletes, parents, coaches and other healthcare providers. The blog would also serve as a forum where readers could share questions and ideas. What I never expected in 2010 was the passion I discovered for communicating this information. Despite long hours in clinic and surgery, I came home excited to open my laptop and write. That passion has created opportunities I never expected. I now write a regular newspaper column, produce a weekly sports medicine podcast and write for many publications and websites. I even wrote a book available in bookstores everywhere – That’s Gotta Hurt: The Injuries That Changed Sports Forever! People often ask me why I chose sports medicine and orthopaedic surgery as a career. The answer is simple. I love seeing the joy on my patients’ faces when I tell them that they can return to their sport or exercise. Fitness and sports are not just important for physical health. They are often a huge part of the lives and happiness of people of all ages. While you might not be a patient in my orthopedic surgery practice, I want to help you just as much as the patients I see in clinic. On this site, I constantly strive to provide you information to help you get back to what you love to do. This page offers a variety of information about me, my sports medicine and orthopedic surgery career and practice, and my writing and media work. You can click on any of the links below to read a particular section. I am an orthopaedic surgeon and sports medicine specialist in Charleston, South Carolina. I recently started my own practice after spending eight years as Director of Sports Medicine at an academic medical center. Learn more about my practice. I hold a board certification from the American Board of Orthopaedic Surgery in Orthopaedic Surgery as well as a subspecialty certification in Orthopaedic Sports Medicine. Currently, I serve as the Communications Council Chair for the American Orthopaedic Society for Sports Medicine Board of Directors. I also serve as Chairman of the Publications committee for the American Orthopaedic Society for Sports Medicine (AOSSM). 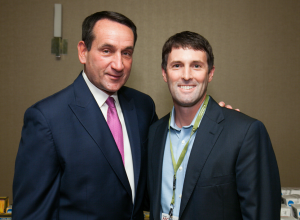 I serve on the Medical Aspects of Sports committee for the South Carolina Medical Association. I have previously served as the Chairman of the Public Relations committee for AOSSM. Education of healthcare professionals who treat athletes is extremely important to me. Therefore, I am actively involved with sports medicine journals and health publications. I am a member of the editorial board of the Orthopaedic Journal of Sports Medicine: An Open Access Journal for Orthopaedic Sports Medicine, Arthroscopy and Knee Arthroplasty and Outpatient Surgery Magazine. I am a principal reviewer for the American Journal of Sports Medicine and a reviewer for Sports Health: A Multidisciplinary Approach. Professional and other elite athletes provide an amazing opportunity to work with individuals with unmatched strength, speed, and ability. 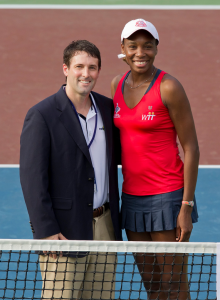 I served as Chief Tournament Physician for the Family Circle Cup women’s professional tennis tournament for seven years. I have also served as head team physician for the Charleston Battery professional soccer team. I have also served as a physician for USA Rugby and the U.S. women’s national soccer team during their appearances in Charleston. In my sports medicine fellowship, I worked with the medical teams who provided care for the St. Louis Cardinals and St. Louis Rams. In my practice, I treat athletes of all ages and skills levels. While I treat musculoskeletal injuries throughout the body, I particularly focus on knee and shoulder injuries and the arthroscopic surgeries to treat them. I am also especially passionate about youth sports injuries. I work to prevent them in any way I can, both in my practice and through speaking and writing opportunities. Just as I love explaining sports injuries and other sports medicine and wellness topics in my office and discussing them on my website, I am grateful to have opportunities to do it for television, radio, newspapers, and online media. Some of the larger publications for whom I have done interviews include USA Today, The New York Times, The Washington Post, The Boston Globe, The New York Post, CNN, NBC News, ABC News, Huffington Post, US News & World Report, The Atlantic, Forbes, Business Week, Bloomberg, The Associated Press, Reuters Health, Yahoo! Sports, FOX Sports, CBS Sports, ESPN, ESPNw, The MLB Radio Network, NASCAR, NBC Sports Radio, SiriusXM Radio, Health Magazine, Women’s Health, Men’s Health, Men’s Fitness, Men’s Journal, Popular Mechanics, Prevention, MSN Healthy Living, Marie Claire, Livestrong, WebMD, and Real Simple. Please go to my Media page for examples of some of the interviews I have done as well as a detailed list of interviews and media appearances over the last few years. Click here if you are a journalist who would like to discuss a story idea with me. If you would like to request an appointment to see me as a patient in my sports medicine practice in the Charleston area, please complete the form on my Contact page. For more information on specific information as it pertains to this website itself, please refer to information on the following pages. Lastly, I want to thank you for visiting this site. I receive thousand of comments and questions from readers and listeners all over the world. It means more to me than you could know that my information helps you in some way. Please do not hesitate to contact me if you have ideas for articles or show topics or questions that I could answer. Thank you! The contents of DRDAVIDGEIER.COM (“Site”), such as text, graphics, images, audio, and other materials (“Content”) are for informational purposes only. THE SITE MAY OFFER HEALTH, FITNESS, NUTRITIONAL AND OTHER SUCH INFORMATION, BUT SUCH INFORMATION IS DESIGNED FOR EDUCATIONAL AND INFORMATIONAL PURPOSES ONLY. THE CONTENT DOES NOT AND IS NOT INTENDED TO CONVEY MEDICAL ADVICE AND DOES NOT CONSTITUTE THE PRACTICE OF MEDICINE. YOU SHOULD NOT RELY ON THIS INFORMATION AS A SUBSTITUTE FOR, NOR DOES IT REPLACE, PROFESSIONAL MEDICAL ADVICE, DIAGNOSIS, OR TREATMENT. THE SITE IS NOT RESPONSIBLE FOR ANY ACTIONS OR INACTION ON A USER’S PART BASED ON THE INFORMATION THAT IS PRESENTED ON THE SITE. Please refer to the full Disclaimer about Medical Advice and Information for more information.